Calling any trail in Oakland County “Wilderness” is a little presumptuous. Or a lot. Still this 5.75-mile loop in Holly Recreation Area is a dandy, an oasis in the urban sprawl that someday will turn Dixie Highway between Grand Blanc and Pontiac into nothing but an endless strip mall. This trek is not wilderness by any stretch of the imagination but it does get you into the woods and away from traffic, pavement and the developed areas of this state park. 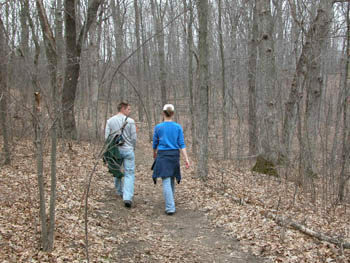 The trail lies north of McGinnis Road and loops around McGinnis Lake Campground and its namesake lake. You see the lake but never the campground or those staying there. Wilderness Trail stays in the woods, climbing a number of surprisingly large hills and descending pass wetlands, ponds and small lakes. Occasionally you can hear the traffic or even see a house but this as natural an escape as you’re going to find in Oakland County. 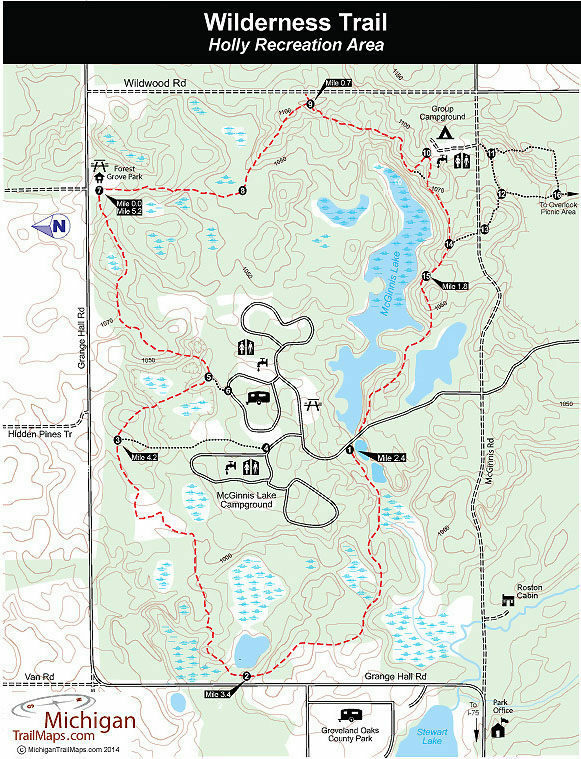 Wilderness Trail can be picked up from several places within the recreation area including near the McGinnis Lake Campground where post No. 1 is located and from the Overlook Picnic Area in the Heron Lake day-use area. In the Overlook Picnic Area the trail is posted in the second parking lot and makes for a 5.75-mile loop. You can also begin from several roads that encircle it or from Forest Grove Park, a Groveland Township park on Grange Hall Road and the starting point for this description. Few if any mountain bikers will be seen on this loop, they have their own trail system – the Holdridge Lakes Mountain Bike Area – on the west side of I-75. Hikers will find the trek delightful in April as well as September and October. In November the views improve with the disappearance of foliage and in June and July it can get buggy. Just keep moving. Located in the back of Forest Grove Park is post No. 7. Following Wilderness Trail in a clockwise direction you immediately enter the woods along a rolling route through the hilly terrain, a trademark of this trail as much as the numerous marshes and lakes that it weaves past. You pass three marshes before passing post No. 8 and then make a steady climb to post No. 9, reached at Mile 0.7. A short spur heads east (left) to connect the post to Wildwood Road. The main trail heads south (right) and begins the most scenic stretch of the loop. Within a quarter mile you’re sidling a ridge high above what looks like a marshy valley below and then come within sight of McGinnis Lake. The trail swings east and at Mile 1 you pop out at post No. 10, at the edge of the group campground where there is a hand pump for drinking water. From the campground the trail climbs a hill to almost 1,100 feet where you can look down at the marshy east end of McGinnis Lake and the ridges that enclose the lake. A long descent follows to post No. 14, marking the junction with a trail that heads south (left) for Overlook Picnic Area on Wildwood Lake. Wilderness Trail heads northeast (right) at the junction and descends to post No. 15 at Mile 1.8. Here you can follow a short spur north (right) to the marshy shoreline of McGinnis Lake. The main trail continues west (left) and begins with an immediate climb, topping off to views of the inland lake. You skirt ridges above the shoreline before finally descending and popping out at the park road to McGinnis Lake Campground. Use the road bridge to cross the dam that created the lake and on the north side you will spot post No. 1. 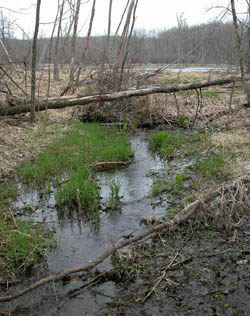 The trail immediately re-enters the rolling woods dominated by pines, skirting a pair of ponds and a vast cattail marsh. Within a half mile from the park road you break out in a grassy meadow and can look down at Stewart Lake and the Groveland Oaks County Park campground. The trail continues north back into the woods, swings within view of a house on Van Road and at Mile 3.4 you arrive at post No. 2 located near the edge of small marshy lake. The forest is now more hardwood than pine and the next few miles can be stunning in October. The loop swings east beyond post No. 2, reaching post No. 3 at Mile 4.2 Here a spur heads south (right) to the modern campground at McGinnis Lake. The main trail heads southeast (right) where it begins the longest descent of the day, dropping more than 60 feet to bottom out at a marshy pond. You climb briefly before arriving at post No. 5 where another spur, a considerably shorter one, heads south (right) to the modern campground. The main trail swings northeast and threads its way between two cone-shaped kettles and after a long climb skirts a marsh area below. Shortly after the wetland, you return to Forest Grove Park at Mile 5.2. This description begins from Forest Grove Park, a Groveland Township park on Grange Hall Road. Just after crossing Dixie Highway, Grange curves to the north (left) and then within a mile curves back to the east (right). Head 1.2 miles east and Groveland Township Hall with be on the right side of the road with the park located behind it.